Despite a difficult growing year, exhibits were as plentiful as ever and of the usual high quality. 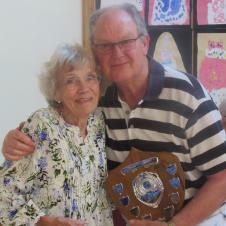 The prizes were awarded by Mary Schofield who has supported the Committee for over thirty years. Her service was recognised by the award of the new "Schofield Shield" for the entrant receiving most points overall. The winner this year was Malcolm Moss. The 2019 show will be held in Southwick Village Hall - date to be announced. The Show committee has members from both villages. Committee members: Liz Barnish, Monica Crosby, Pauline Davidson, Joy Eastland, Paul Grandidge, Brigitte Hilton, Julie Hyne, Mary Schofield, Ursula Wide. Our AGM will be held on Thursday 20th September in Southwick Village Hall – please come along. Please contact either Pauline Davidson (01832 273526) or Brigitte Hilton (01832 273848) for more information about the Southwick & Glapthorn Annual Village Show.